Whiteville, NC – The Leapfrog Group, a Washington D.C.-based organization aiming to improve health care quality and safety for consumers and purchasers, today released the new Leapfrog Hospital Safety Grades for Fall 2018. 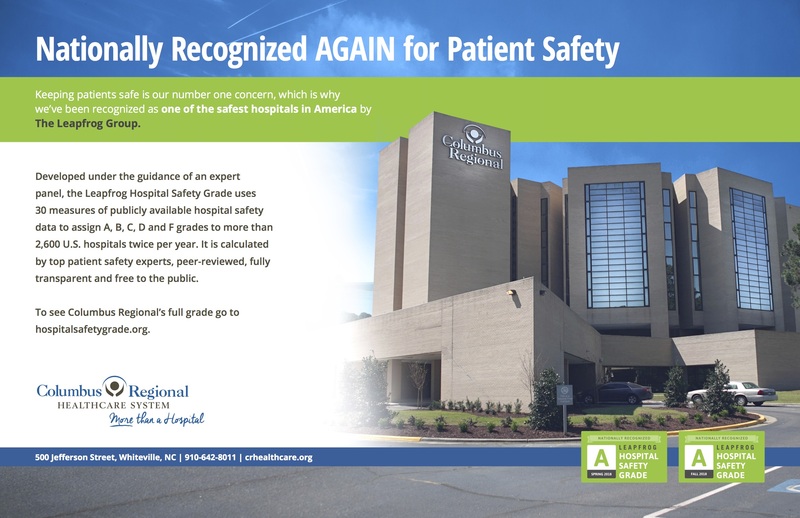 Columbus Regional Healthcare System was one of 34 hospitals in NC awarded an ‘A’ for its efforts in protecting patients from harm and meeting the highest safety standards in the U.S. The Safety Grade assigns an A, B, C, D or F grade to hospitals across the country based on their performance in preventing medical errors, infections and other harms among patients in their care. “The employees at CRHS continue to work relentlessly each and every day to provide the safest care to our patients. We are proud that these efforts continue to be nationally recognized by Leapfrog,” said John Young, CEO Columbus Regional. “This honor is based on the important steps we take to protect our patients from harm: communication and involving patients and families in their plan of care, utilizing evidence based practices, ensuring we are doing the right thing, at the right time, every time and training our staff and leadership to listen and work collaboratively to reduce errors,” said Young. “The CRHS Leadership Team in-conjunction with the entire hospital family has done remarkable work in making this achievement possible,” stated Young. To see Columbus Regional’s full grade details, and to access patient tips for staying safe in the hospital, visit www.hospitalsafetygrade.org and follow the Leapfrog Hospital Safety Grade on Twitter and Facebook.